5105 ⊙ 58IAM 6 Pes. 25 Cts. On 5 Mk. Black / dark carmine, the so-called \"Minister print\", fresh colors and very well perforated, neat cancelled \"Tangier 20.11.11. \". A very nice copy of this rare issue! Photo expertize \"faultless condition\" Jäschke-Lantelme BPP. 5137 / 2 1 d. On 5 Pfg. 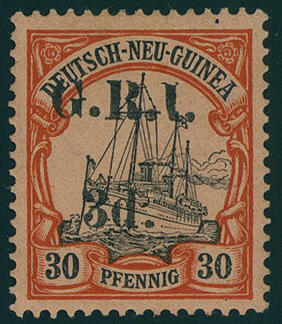 Green, spectacular corner margin strip of five lower right with edge lettering \"German new guinea\" and overprint variety \"3. 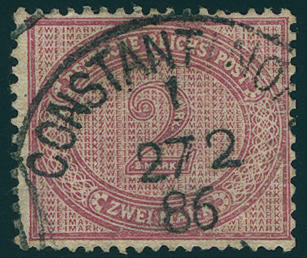 Stamp with far gap between 1 and d\", perforation between the 2. And 3. Stamp slightly prefolded, right a little separated. An extremely decorative and extraordinarily scarce unit! 5138 8I 3 d. On 30 Pfg. Imperial yacht, overprint type I with very scarce \"setting 7\" (position 5), fresh colors and in perfect condition unused with original gumming. There are only few examples from this known. A rarity of this area! Photo report Peter Holcombe. Michel / Gibbs handbook 6250,- €. 5139 10I 5 d. On 50 Pfg. Imperial yacht, overprint type I, very rare \"setting 4\" (position 3), fresh colors from upper margin, in perfect condition unused with original gumming. An extraordinarily scarce issue, of the only a few copies became known are. Photo report Dieter Holcombe. Michel / Gibbs handbook 6000,- €. 5140 ✉ 86I 10 Pfg. 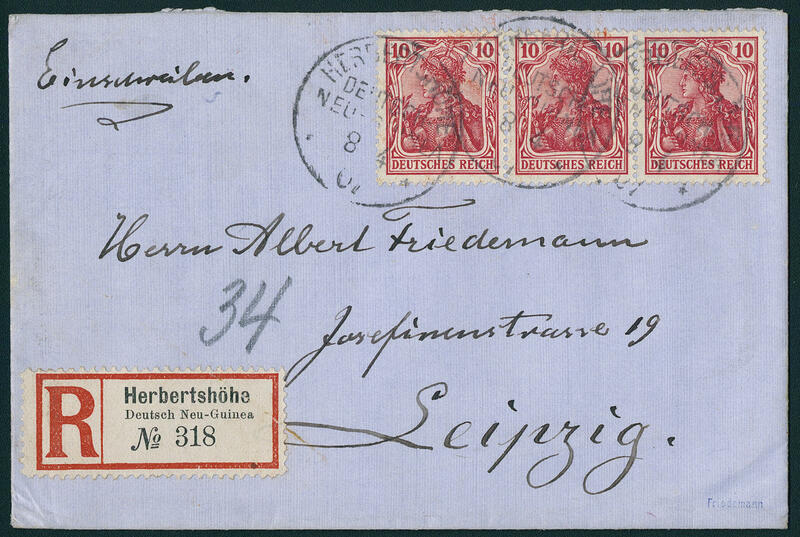 Germania, peace printing, horizontal strip of three, in perfect condition as correctly franked follower franking on very nice registered cover with single circle postmark \"HERBERTSHÖHE 8.4.01\" with inverted today's date to Leipzig with arrival postmark. 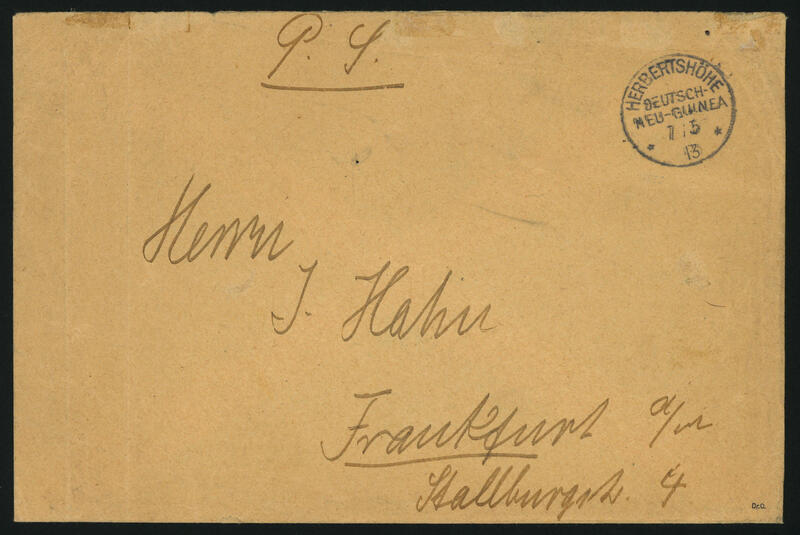 Registered covers with multiple franking the follower are very rare! Expertized Steuer BPP. 5130 ⊙ 37eV 2 Mk. 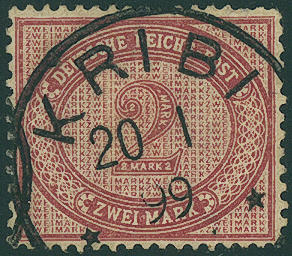 Dark red crimson with plate flaw \"large interruption in the guilloche lower left\", defects, especially nice and neat cancelled \"KRIBI 20.1.99. \". This plate flaw is by Michel catalogue unlisted and is extremely rare. Photo expertize Jäschke-Lantelme BPP. 5141 1 Mk. Black / red / blue, contribution stamp for the German-English Air ship-sending 1913, fresh colors and very well perforated from right margin of sheet watermarked \"cross and rings\", unfolded and in perfect condition mint never hinged, without any signs. An outstanding quality of this rare issue for the highest standards! Photo expertize Steuer BPP. 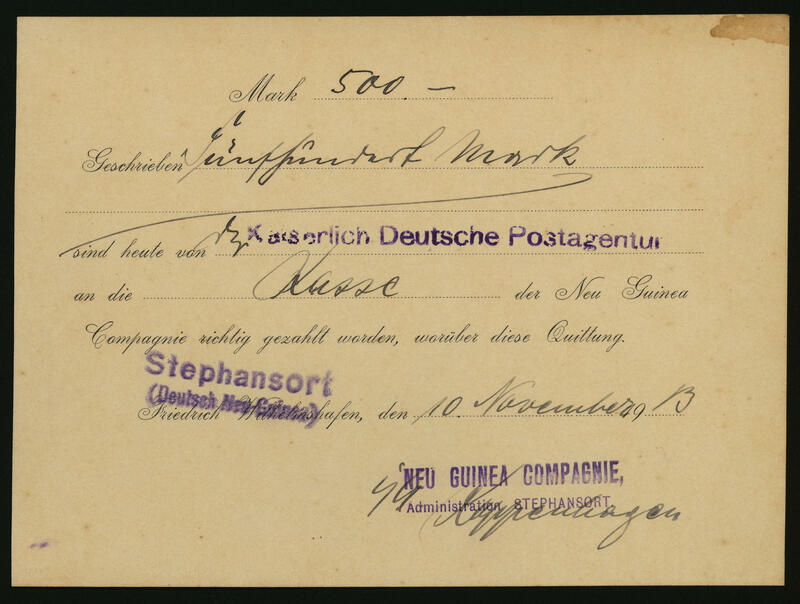 5135 ✉ \"HERBERTSHÖHE German new guinea 7.5.13\", clear on post paid articles of mail cover, slight traces of usage, to Frankfurt with on the back seal of office \"Imperial German post office HERBERTSHÖHE\", extraordinarily scarce utilization. 5136 ✉ \"STEPHANSORT (German new guinea) \", violet two-line cancel clear on payment receipt for the postal service agency Stephansort from 10.11.13 over 500 Mk. The postal service agencies in German New Guinea swaddled your money traffic especially from the money order service with Aid the Cash registers the New Guinea-Compagnie or the district velvet from, about characteristic safety precautions for Movement larger amounts of money to save. An extraordinarily rare postal form. 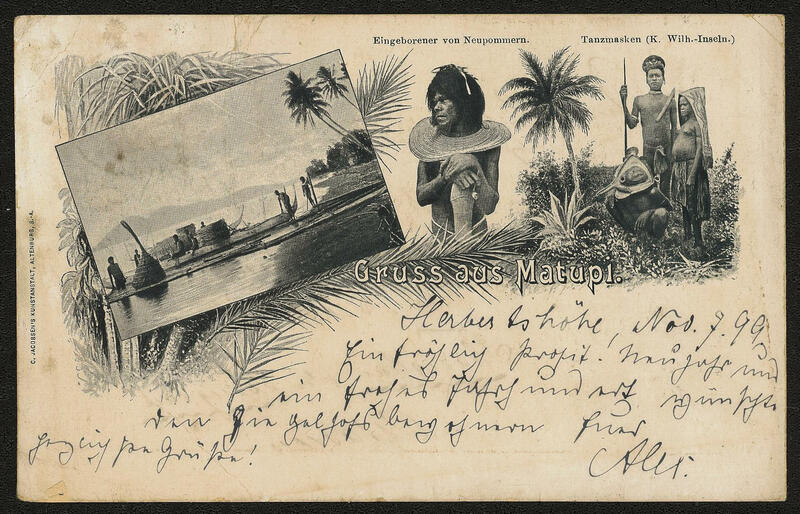 5131 ✉ 2 \"greatings from MATUPI\", scarce picture postcard \"native from New Pomerania\", transported from \"HERBERTSHÖHE\" from 1899 to Germany with 5 Pfg. 5132 5aII 25 Pfg. Yellowish orange with plate flaw \"I. 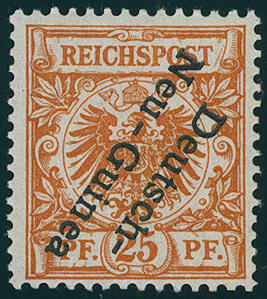 IN REICHSPOST above cleaved\", fresh colors and in perfect condition mint never hinged, without any signs. Michel 280,- €. 5133 5bK 25 Pfg. 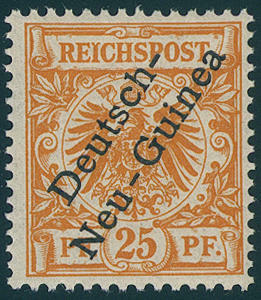 Dark orange with extremely scarce inverted overprint \"German new guinea\", wonderful fresh colors and well perforated, in perfect condition unused with only one tiny trace of a hinge in of the right lower corner. An outstanding quality this colonial rarity! Photo expertize Dr. Provinsky BPP. 5134 ✉ 9,1 10 Pfg. And 20 Pfg. 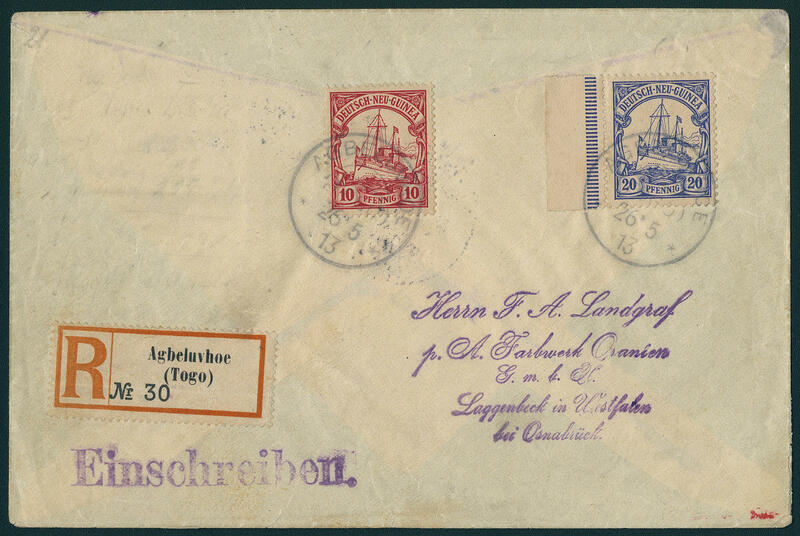 Imperial yacht, German New Guinea, as unopposed foreign use in Togo on correctly franked registered cover with very scarce stamp \"AGBELUVHOE 26.5.13. \" with appropriate registration label to Laggenbeck with arrival postmark. An in several aspects extraordinary cover and in this kind seeming probable unique! Expertized Drahn. 5129 ✉ Hbl.9 German Reich, Germania stamp booklet pane with margin as additional franking on beautiful private postal stationery cover 10 Pfg. 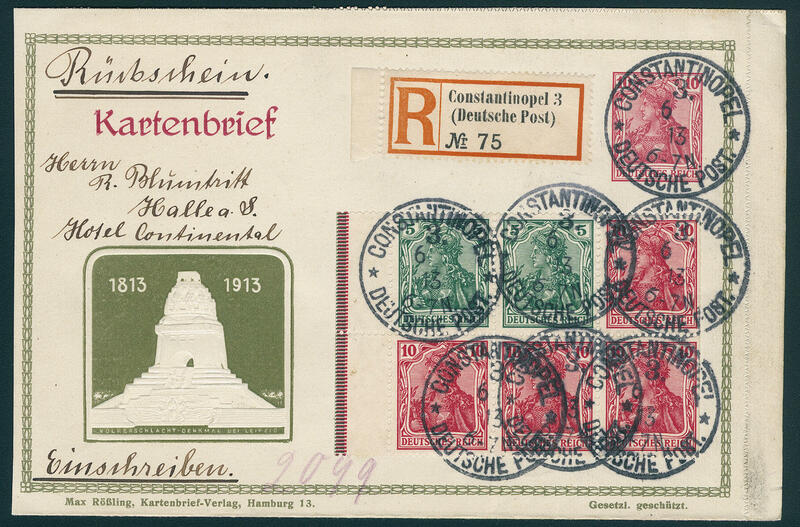 Germania / Battle of Nations monument Leipzig as correctly franked registered cover with return receipt with clear single circle postmark \"CONSTANTINOPEL German post 6. (8). 13. \" (being absent Month date! ) 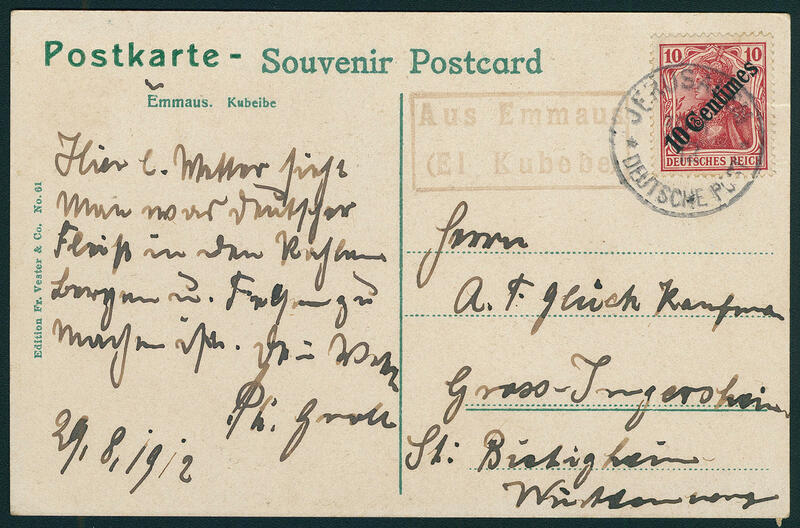 to Halle with arrival postmark. In this kind very rare and a Honor for the sophisticated special collection! Photo expertize Steuer. 5107 ✉ 32 5 pennies bright gray purple, fresh colors on correctly franked franked printed matter, minimal blotched, to Bordeaux / France with clear blue single circle postmark \"imperial German P. A. CONSTANTINOPEL 3.3.80\" with transit cancellation from \"BRINDISI 7.3.80. \". From the forerunner time are printed matters abroad used already extremely rare, in this kind with the rarely blue stamp a rarity of this area! Photo expertize Jäschke-Lantelme BPP. 5108 ✉ 34b 20 pennies cobalt blue, fresh colors and in perfect condition as correctly franked single franking on very nice folded cover with single circle postmark \"CONSTANTINOPEL 12.12.76\" to Nettstall / Switzerland with arrival postmark. 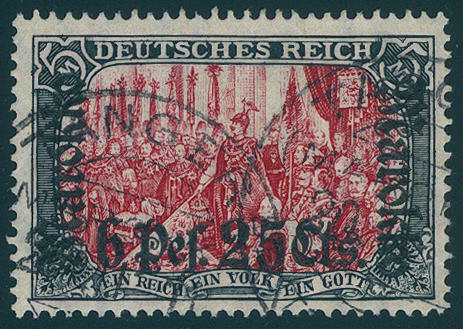 Covers of this rare colour are only in very few copies have become known. These become due to missing offers also in the Michel special catalogue only noted without price! Photo expertize Jäschke-Lantelme BPP. 5109 ⊙ 37c 2 Mk. Dull rose lilac, fresh colors and in perfect condition neat cancelled \"CONSTANTINOPEL 27.2.86\", photo expertize \"faultless condition\" Jäschke-Lantelme BPP. Michel 500,- €. 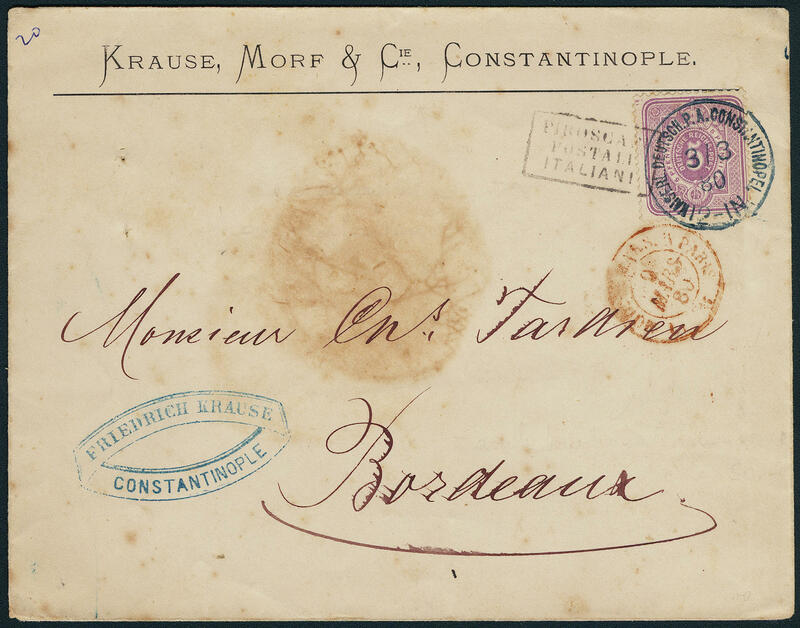 5128 ✉ P11 20 para on 10 Pfg., postal stationery clean commercially used from \"CONSTANTINOPEL 12.1.06. 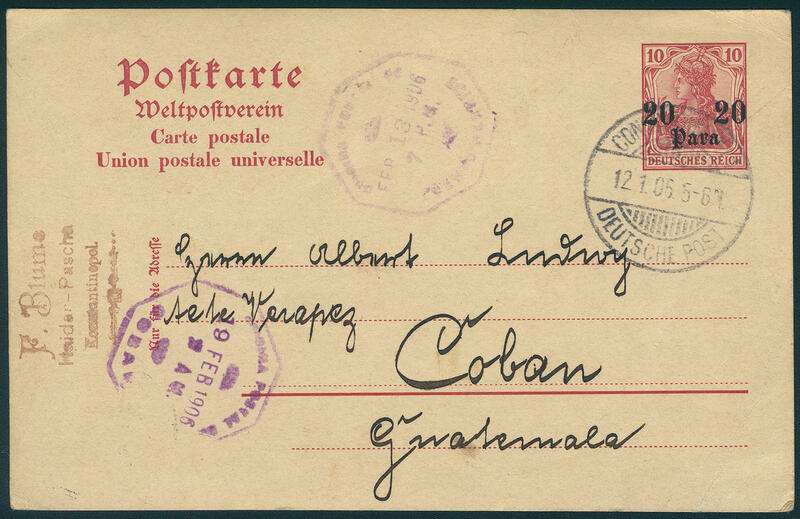 \" to Coban / Guatemala with arrival postmark. Scarce destination! 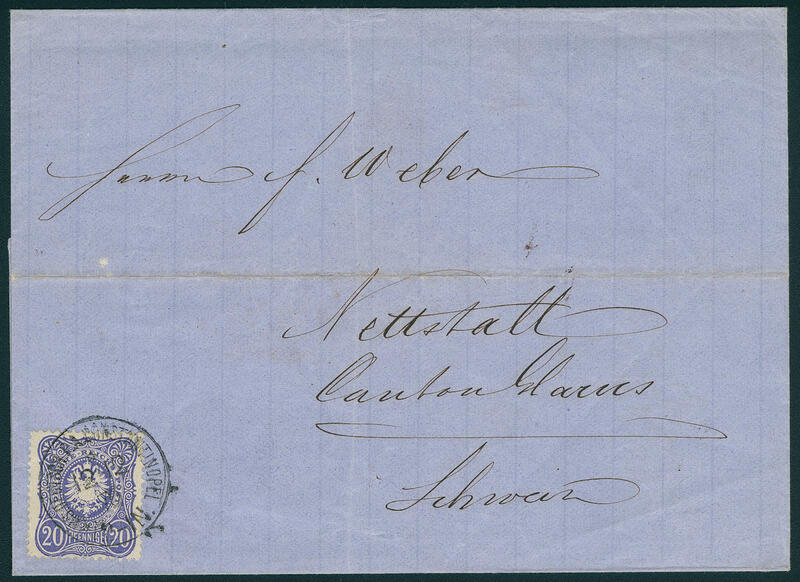 5125 ✉ \"from EMMAUS (EL KUBEBE) \", the extremely scarce additional cancellation in red violet, razor-sharp on very nice picture postcard from \"EMMAUS\" with 10 Cts. On 10 Pfg. Germania without stamp \"JERUSALEM German post 3.8.12. \" from parent post office to Germany transported. There are only few documents this very rarely stamp have become known, whereby especially franked examples nearly unknown are. In this excellent quality a Honor for the sophisticated special collection of the German international post offices abroad and colonies! Photo expertize Steuer BPP. 5126 ✉ \"from JERUSALEM German post\", rare rectangle cancel additional clear on picture postcard with 20 para on 10 Pfg. 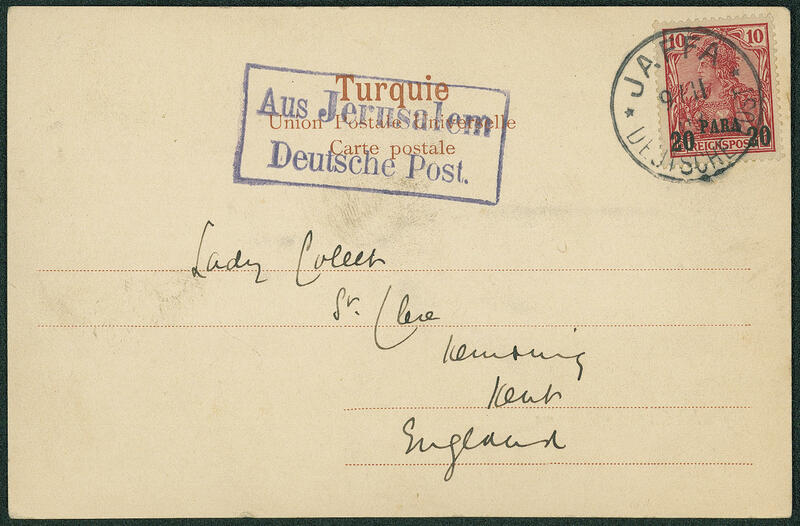 And single circle postmark \"JAFFA German post 9.11.03\" to England.